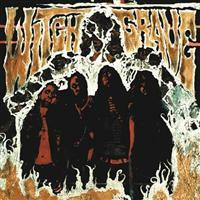 Växjö band WITCHGRAVE follow up on their first outing, the mini album “The Devil´s Night”. These satanic metal merchants have dedicated themselves to the NWOBHM they say, especially the likes of VENOM, HELL and ANGEL WITCH. Just a few years ago no one spoke of Dave Halliday (R.I.P.) et al, which caught my attention. The lineup is Jocke Norberg, vocals/bass, Tobbe Ander, guitars, Gabriel Forslund, guitars, and Sven on drums. No keyboards here no. The titles are seeping with seventies horror movie themes…so…rock me! Opener “Raising Hell” is a piece of very raw-edged VENOM-ish music, paired with a sore throat screaming. No similarities with “Save Us from Those Who Would Save Us” there nope. “The Virgin Must Die” has me thinking more of a rough MERCYFUL FATE, or possibly PORTRAIT. The lyrics shout WITCHFINDER GENERAL meets VENOM before copulating with BLACK WIDOW. The riff is perfect, but yet again the roughness, which reminds me of DEVIL LEE ROTH. The album continues along those lines as BLACK SABBATH is continuously paired with vomiting vocals and crude guitar sounds. There might be a lot of NWOBHM in the guitars, but that is sort of drowned in the flood of vocal excesses. The finest moments are “The Virgin Must Die”, that echoes of every out of print in your face satanic panic early seventies horror movie you can find on YouTube, and the SAXON-esque “Motorcycle Killer”. The latter being the first ever interpretation of what it would have sounded if Tony “Demolition Man” Dolan would have done a surprise move in the mid eighties and all of a sudden became the front man of SAXON! Otherwise I think closing track “Shun the Light” says it all. These blackened metal warriors do a crude take, in the last track spiced by an anomaly of doomy overtones, on VENOM, with nothing much more in common with the New wave of British Heavy metal.